Guy's Gulch to Mach Chicken was a good run, awesome speed, and berms. We were unsure where to go after the end of mach chicken. Ended up going down some logging roads after going down a path called "Coaster" - (Note from Becky - I think this trail was actually marked for the Coaster Race and is likely in the Brodie/Circle Trail area). Second time biked up to Black Tower. Black Tower was a great a run as well, excellent flow and berms. Charlie Brown was a good run as well, Pumpkin Patch and Patricks Pass had some up hill climbs, but fun as well. Might have gone on "Janets Jungle" but was unsure. Better signage in some spots would be helpful to tie trails together. Well worth the effort to visit if you are looking for "flow"
You were so close to those other trails! 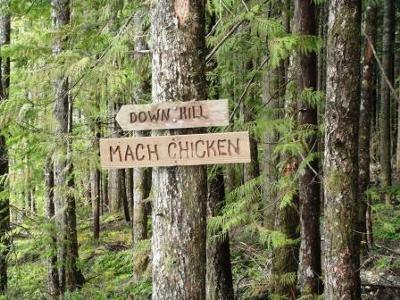 Janet's Jungle trail actually has a sign and runs off of Dude's Bypass and Sleepy Hollow wasn't far from Mach Chicken. Too bad you missed them!